Dr. McConnell’s research interests include snow and global-scale hydrology, ice core and atmospheric chemistry, glaciology, and ice sheet mass balance - with particular emphasis on understanding the role of human activities in global climate and sea level change. 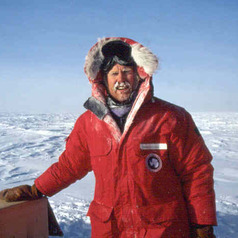 Current NSF, NASA, and internally funded research projects include ice core chemistry-based studies in Greenland, Antarctica, and the Americas. Central to this research are national and international collaborations (e.g., British Antarctic Survey, Australian Antarctic Division, Instituto Antártico Argentino, Norwegian Polar Institute) and DRI’s unique ultra-trace ice core analytical laboratory. This laboratory is capable of simultaneously measuring in ice cores a broad suite of elements in quantities as low as parts per quadrillion and at very high depth resolution. McConnell’s group also conducts collaborative research in hydrology and water balance in snow-dominated, semiarid regions such as the American West as part of the NSF-funded SAHRA Science and Technology Center.